It all started with me making a glitter covered train which was super lovely and all but it kept getting A. attacked by the dog and B. wheels full of cat hair that just wasn’t going to work out in the long run. This glitzy guy just wasn’t going to make it for the long haul (get it, harharhar, :) unless it was raised off of the ground. And so this project that took a few years of my life started out something like this… I texted Rob asking if he would go by Lowe’s for me on the way home. When he answered in the affirmative I sent him a link to what I needed with a note that I thought it would fit in his car but as it was with him I couldn’t measure to check. So the time for Rob to get home comes and goes and normally I’d start with worry but instead I figure he’s scratching his head in the Lowe’s parking lot trying to figure out how to get this board into his car that I suddenly realize is probably, definitely a little too big. And when the phone rings it’s Mr. Rob and he’s not terribly happy because the wood will not fit in his car. I’m in the middle of something so I ask him to return the wood and we can try again this weekend and he gives me a flat out NO and tells me that I need to get out there now. I load up the dogs, ’cause that’s how I roll, and head on out to the lumberyard to try and figure this business out. I get there and Rob looks so frustrated but upon seeing the dogs being goofy and terribly excited chippers up a bit. Go me, at least that worked out well :) It turns out he was going to make this board fit come hell or high water and he’s scratched up the interior of his car but alas, even his best efforts cannot make the square peg fit in the round hole. So I get the wood, make the thing and… guess what? I purchased for my train table, just because I had a momentarily lapse of weakness, the added expense of about $6.50 per leg for the wood and mounting hardware or $26 for the entire table because I thought it would be pretty. This large expense for a once a year use project is HUGELY out of character for me. So I guess I shouldn’t h have been surprised that when I put the legs onto the table the hardware for one broke and I suddenly had one leg that wasn’t going to work. Sigh. They were pretty little legs, albeit too tall, though, but at least I get my $$$ back now that I’ve been knocked back to my frugal DIY senses. Raiding the wood pile I work up the table aaaaaaand it’s too freaking tall. But I don’t notice that quite yet. What I do notice is there is an awful lot of space above the ground in which you can really see the tree stand, and, a huge part of this project was to obscure and hide away that ugly base. But no worries, I have an idea. Oh, and my freaking table looks like a crappy parade float. And it doesn’t really matter because the whole business is so high that the train hits the branches underneath the tree and gets stuck. *sigh + painfully high eyeroll* And while we’re at it I decide that I HATE that I painted it. Back to the drawing board! But look at that! 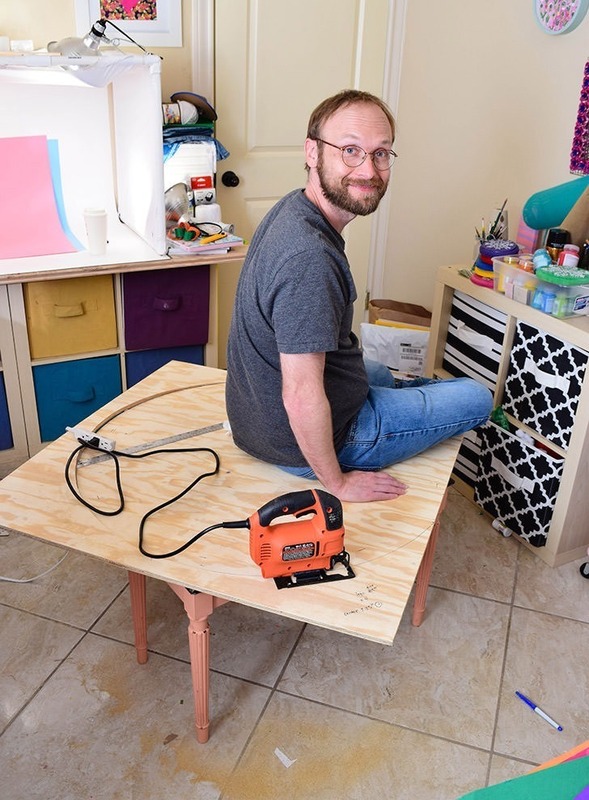 In the end I decided to step back and deal with things another day, and on that new day I made something that I love the look of and that works in all of the ways I had hoped it would and that only cost me the price of that plywood that didn’t want to fit in Rob’s car. Not bad, right? 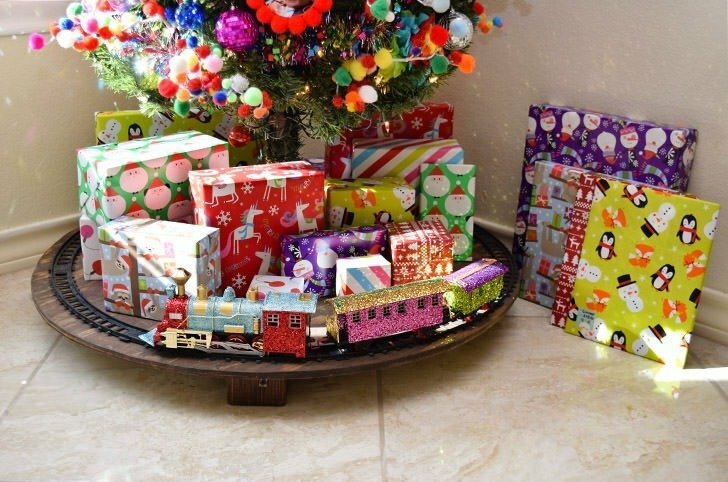 Want to see how you can make an awesome train table that will hide away your ugly Christmas tree base? Let’s do it! 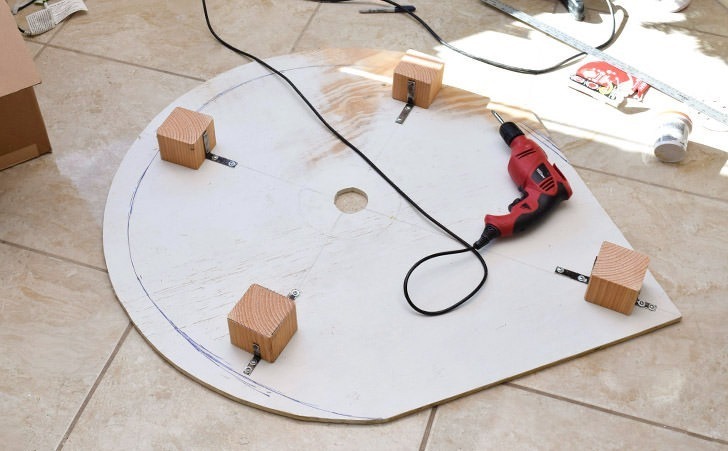 The basic shape of our train table is going to be a 90 degree angle to slide into the corner with a rounded edge that mimics the shape of our train’s track. 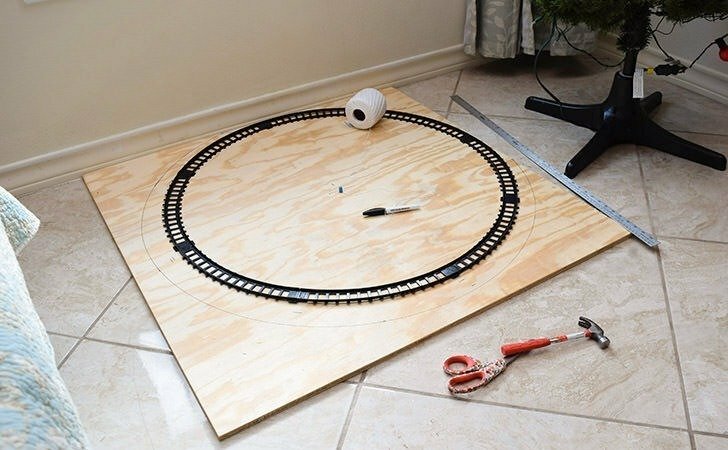 Take your large piece of plywood and place your track built in a circle on the top. Move the track to where there is about an inch of room between the track and the edge of the wood in that corner. 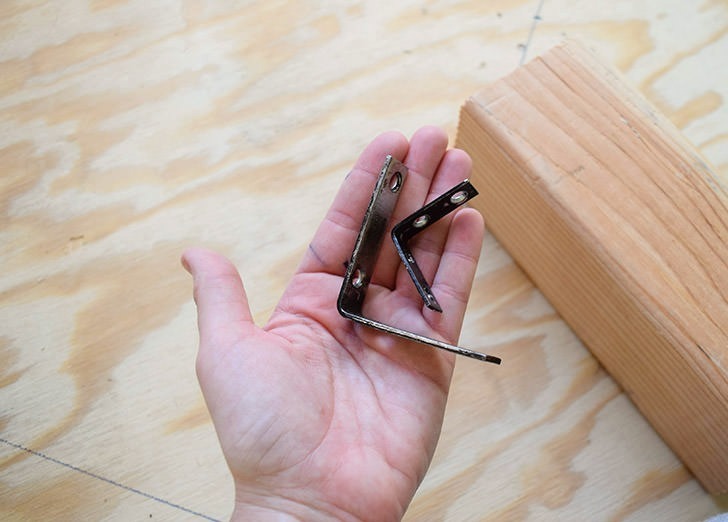 Measure out the center of the track on the wood and place a push pin or thumbtack in the center. Attach a piece of string to the tack and attach a pencil, pen or marker to the string measuring out 1-2 inches longer than the radius of your circle. 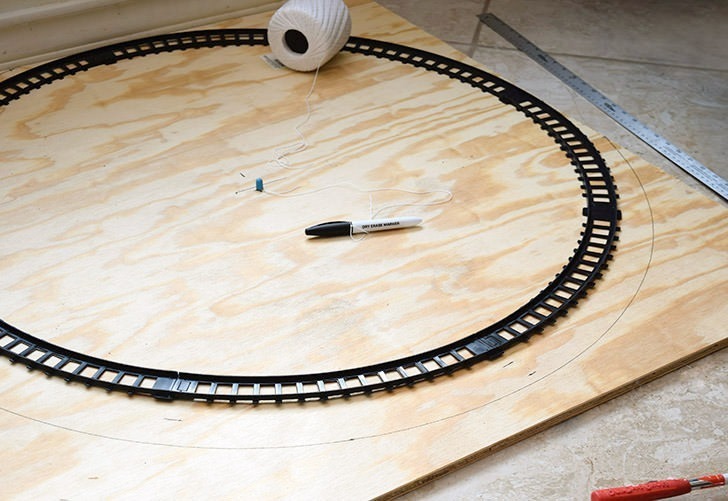 Holding the pencil straight up and down, pull the string away from the tack (while it stays securely fastened to it) around the wood drawing a perfect circle around your track. Now using a jig saw cut the circle shape out of the wood. 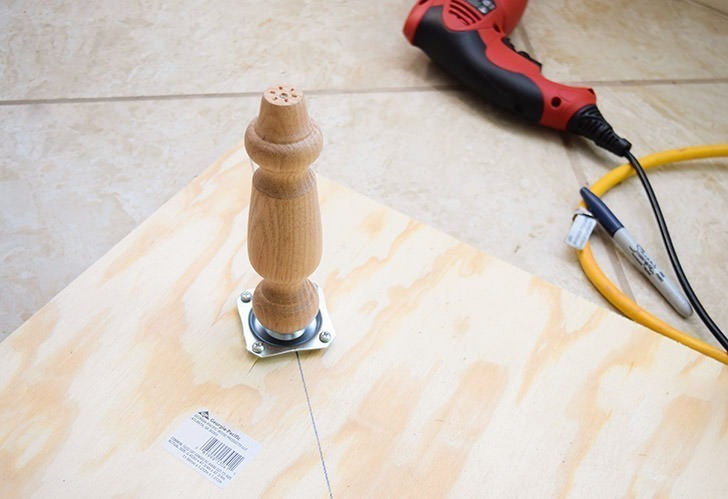 As you cut you’ll need to hold the piece you’re cutting away up because if it hangs too low the wood might split or it could put a lot of extra pressure on your thin, little jigsaw bit. *Quick tip – something of this shape and size can be difficult to hold and cut so I used an aluminum yardstick, slid beneath the cut piece, to hold it up and keep it from falling downward messing business up for me. 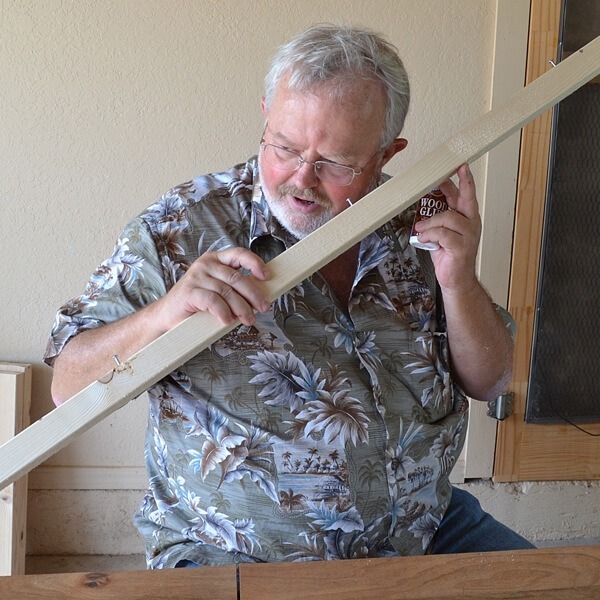 Grab 8 angle brackets/corner braces and trim your 4×4 lumber to 3″ pieces. Again, these are from a bed my dad and I made. 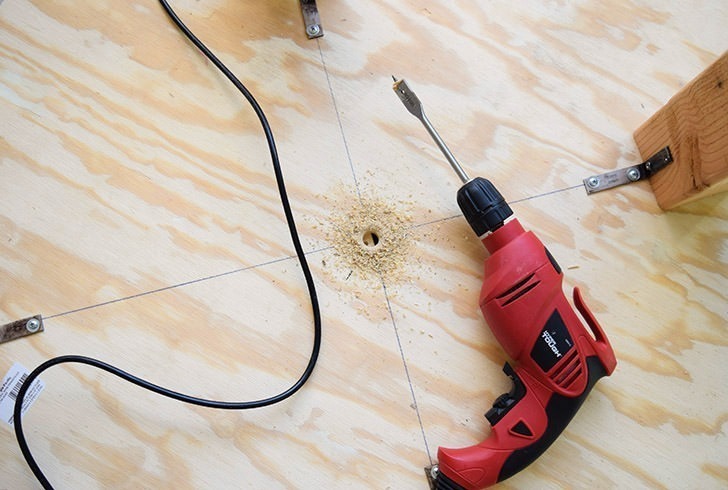 Drill a hole in the center of the table and measure the size of your Christmas tree base to discern how wide you need to create the hole in the middle to give the base room to stand through that hole with an inch or so to spare for wiggle room. 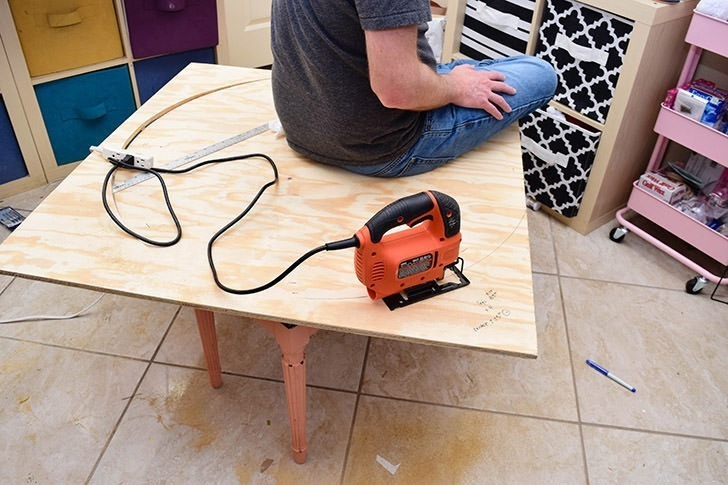 Flip the table over and make sure there are no cats in the room (because cats will swat at anything under a table, even a saw blade, I’d think) and cut out the center hole as needed. Stain or paint your table as you’d like. 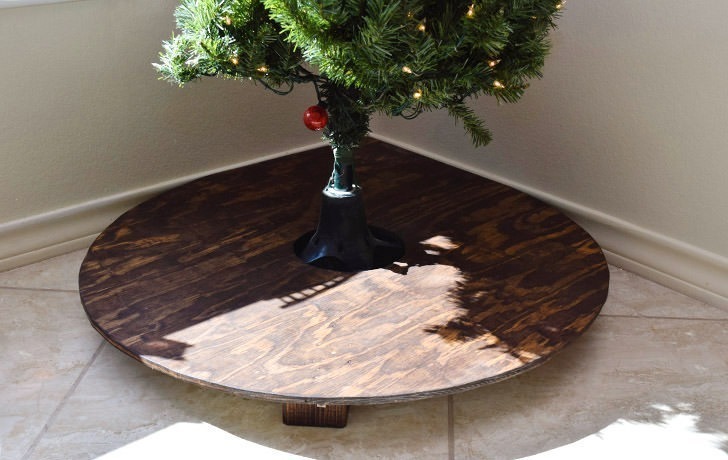 Place it over your tree base in the corner of your room. Insert your tree into the base and this guy is done! 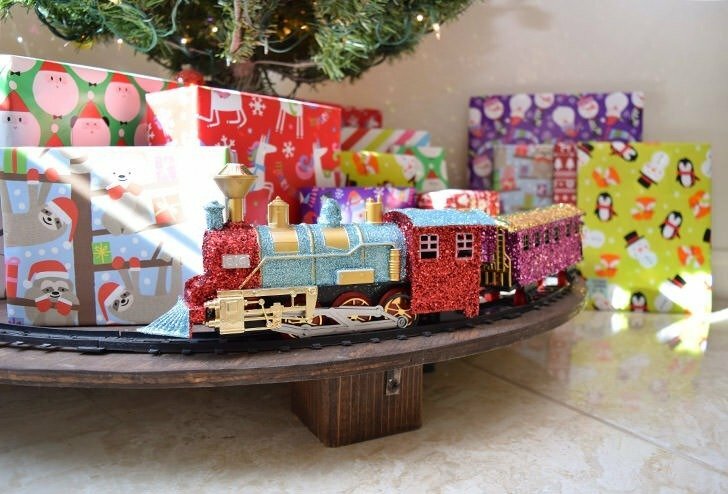 Now you just need one of these groovy glitter trains and a bunch of wrapped gifts to fill your train table out! Now this project was definitely rife with trouble, but in the end I was able to accomplish all of my goals… I got my train up off of the ground keeping it from getting all tangled up in cat hair when it rolls around the tree AND I got the gifts up so that the tape on the underside of each package doesn’t become furry, too. 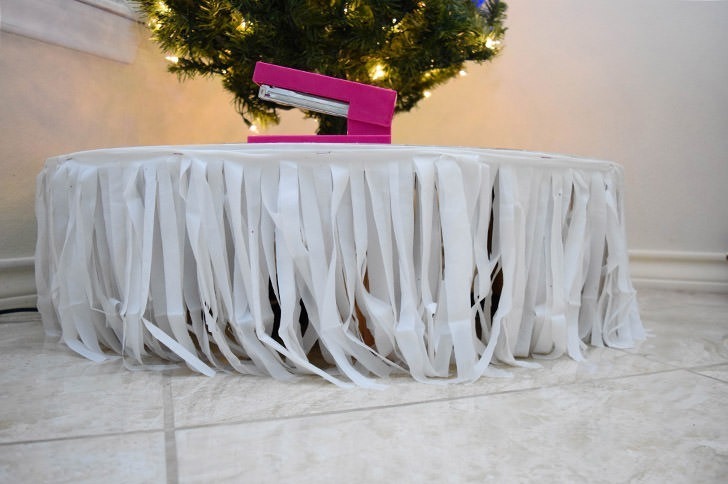 Because no matter how many times you sweep when you have cats fur runs rampant in your home. 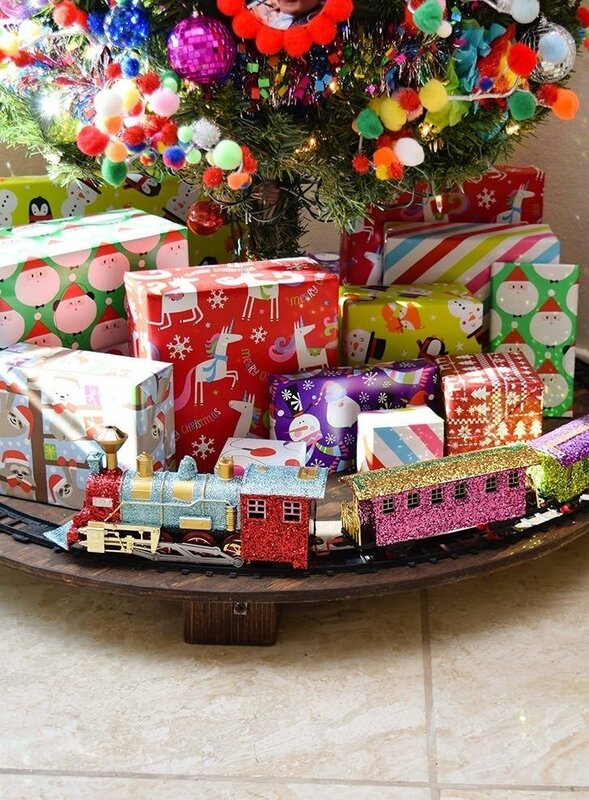 I also thing that this looks so much neater than just a train on the floor and ugly Christmas tree base is largely hidden by the table and the train and gifts on top of it. So all in all, I’d have to say this is one project I’m especially proud of making it through, warts and all! 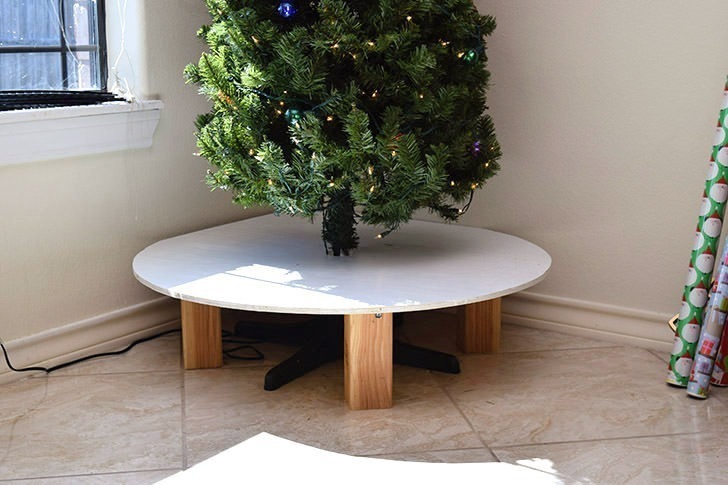 :) OH, if you have cats that climb trees (mine are getting too old or are simply too fat) you might want to cover your Christmas tree base with a gift to hide that base and steady your tree considerably.